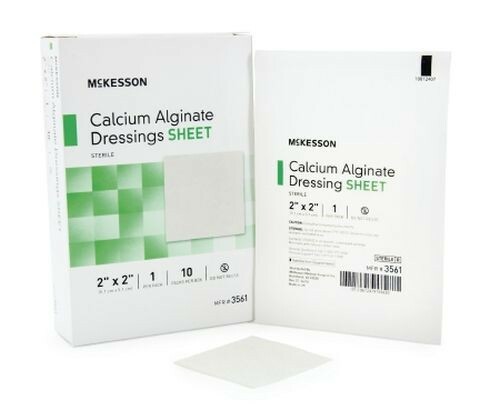 Calcium Alginate Dressings by McKesson are square, sheet dressings that are used as a primary dressing that is designed to be cut to fit wounds with moderate to heavy exudate. The dressings absorb wound fluid while helping to maintain a moist wound environment. The seaweed-derived alginate turns to a moist gel mass material when saturated, helping to regenerate skin and expedite the healing process. Requires a secondary dressing. 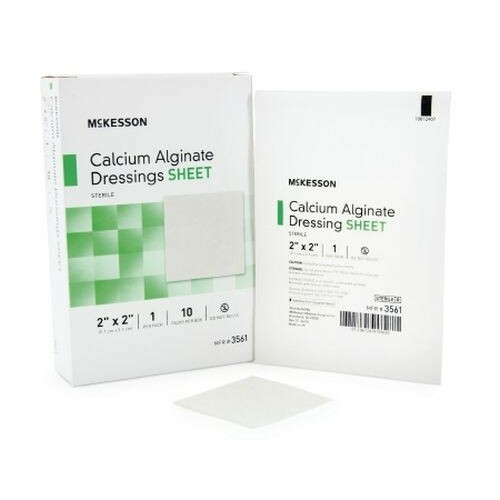 Vitality Medical also carries other items that would pair well with the Calcium Alginate Dressings, such as Mepilex Border Dressing and Betadine Povidone Iodine Solutions. Indications: Wounds with moderate to heavy exudate. May help absorb minor bleeding. Contraindications: Patients with a known hypersensitivity to the product itself or to its components. Change Frequency: Change dressing as directed by a healthcare professional. Can Be Used to Fill Amounts of Wound Exudate and May Help Control Minor Bleeding. Optimal Gelling Profile Allows Dressing to Avoid Sticking to the Wound Bed and Helps Maintain Physical Integrity to Allow Removal From the Wound In One Place. We only have one storefront location and therefore cannot accurately answer the question. You can make your purchase through our website; however, and ship it to the location of your choosing.